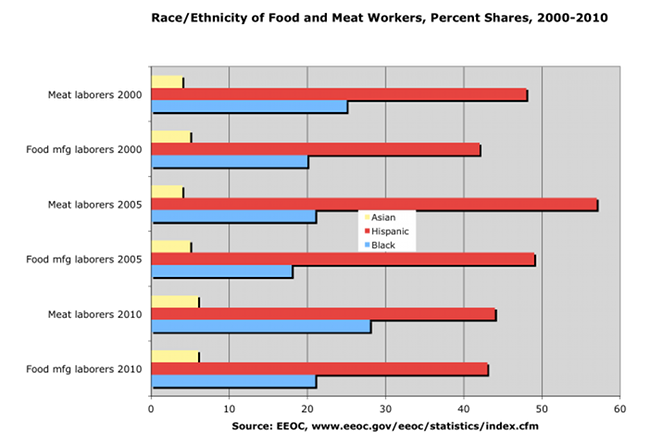 The share of Hispanic workers employed in food manufacturing and meat packing rose between 2000 and 2005 and fell between 2005 and 2010, according to EEOC data. Enforcement of immigration laws may help explain the rise and fall in the Hispanic share of workers. Operation Vanguard, an enforcement effort that subpoenaed records from meatpacking plants, compared employee I-9 information against SSA and INS databases, and instructed employers to ask employees who appeared to be unauthorized to clear up discrepancies in their records before INS agents came to the plant to interview them, was halted in 2000. However, in 2006-07, meatpacking plants were often targeted in immigration raids, including the December 12, 2006 raid at six plants owned by Swift. Stepped-up enforcement of immigration laws combined with wage increases at some plants, the 2008-09 recession, and most meatpackers enrolling in E-Verify, may explain the reduced share of Hispanics in food manufacturing and meatpacking.